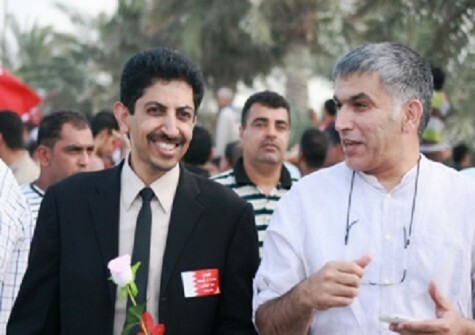 The Gulf Centre for Human Rights (GCHR) calls for an end to the persecution of prisoners of conscience in Bahrain, including its founding directors Abdulhadi Al-Khawaja and Nabeel Rajab. In the latest violation of international standards for the treatment of prisoners, the two men are among those who have had the rules for family visits changed so they are now held behind a glass barrier with no physical contact. On 15 January, Rajab and Al-Khawaja, as well as other members of the group known as the Bahrain 13 (which includes human rights defender Dr. Abduljalil Al-Singace) were informed that all subsequent family visits in Jaw Prison will be carried out behind a glass wall. The separation barrier during the visit has a serious impact on the psychological health of the prisoner and his family and is normally used for serious cases of violent criminals or attempted escapees, not peaceful human rights defenders. In Bahrain, for many years, prisoners have been able to have visits with no glass wall. Imposing the glass barrier on human rights defenders is a form of collective punishment that violates human rights law such as the United Nations Standard Minimum Rules for the Treatment of Prisoners (Mandela Rules), since criminal sanctions are only for the violator and should not be applied to everyone. Under Article 42, married prisoners are normally allowed three hours per month for a husband and wife to meet alone in a room within the prison building, but the human rights defenders and other prisoners of conscience in Bahrain are also denied that right. Zainab Al-Khawaja, GCHR’s Protection Coordinator for Journalists & Human Rights Officer says, "One of the very few things a prisoner looks forward to are the family visits. Despite all the stress and hardship of years of imprisonment, being able to see one’s family is often the only lifeline they have. Most of these visits involve the children and grandchildren of the prisoners." These glass barriers prevent children from having any physical contact with the prisoner. Her four-year-old son has only ever met his grandfather in prison, and they both cherish the physical contact. Losing it is a huge psychological blow and little Hadi will not understand why he can’t hug his grandfather anymore. This decision causes great emotional distress for the prisoners and their families. Prisoners of conscience have also complained in the past few years of having phone calls cut with family members, visits cancelled, reading materials withheld, poor healthcare and other restrictions designed to break down their morale. Al-Khawaja is among prisoners serving a life sentence for their role in the popular movement in 2011. He was badly tortured following his arrest and requires medical treatment for a broken jaw. Rajab, who is also President of the Bahrain Centre for Human Rights (BCHR) and Deputy Secretary General of FIDH, is serving a five-year prison sentence for peaceful comments on his Twitter account about civilian deaths in Yemen by the Saudi Arabia-led coalition, and allegations of torture in Jaw prison. On behalf of Al-Khawaja and Rajab, GCHR asks civil society organisations to conduct ongoing campaigns against the mounting violations of the rights of detained human rights defenders and other detained activists. Ensure that Abdulhadi Al-Khawaja and Nabeel Rajab are treated in line with the UN Standard Minimum Rules for the Treatment of Prisoners, including by allowing regular, unhindered access to their families and providing any medical care they may require.